César Vallejo, Inger Christensen, Alice Roberts, Louis Malle, Alfred Tennyson, Alice Notley, Eileen Myles, William Shakespeare, Andrew Zawacki, P.B. Shelley, David Glimp, Stephen Ratcliffe, Lisa Robertson, Erin Mouré, John Wieners, Robert Urquhart, René Char, John Ashbery, David Hume. In the residue of “old devotions” and new meditations, Julie Carr’s Think Tank archives the still-digesting data from a-life-in-books into the mind, into the body. From the body, Carr gives back a novel text in an act more nuanced than ventriloquism: Think Tank dialogs in the ear-marked pages of ‘literature’ in a style that mirrors the craft of folksong and of jazz; to expand the role of inherited ideas and exponents of style; to take input and produce an output worthy of praising and pushing the boundaries of the art(form). Bubbling in “yeasted minutes” the resulting work presents an “effort to amass some new time” and track a consciousness of melodies that dialog with Vallejo, with Notley, with Myles, with Hume—among others. One has a secret self, a rather delicate pondering inner person. Much of poetry exists to communicate with this entity. Carr’s Think Tank broadcasts an involved music that roams along the historical dial of thinking and makes a strong case for the pleasure of interior life and the pleasure(s) of thinking. Douglas Piccinnini is the author of Story Book: a novella (The Cultural Society, 2015) and, a collection of poems, Blood Oboe (Omnidawn, 2015). Read an earlier view of this book on the Volta Blog here. And it is not just the reader that acts as the intruder onto the inner self, but also the poems themselves, lying both within and outside of the words, “streaks of water between panes of glass.” The words are both present and ever throwing themselves backwards to create a state of being in the real and in the blended frames of a dream where the child-like curiosity and over exposed mind are resolved. — and we begin to sense a book of attempted resolution between the binaries of the poet: the woman and the girl, the mother and the daughter, the artist and the citizen. And yet, these resolutions arrive in great pleasure, the lines, mimicking the book’s title, act as the belly of thought, their pacing music driving us from one image to the next until we are breathing the poem. What might be most commendable about this work is its expansive leaps of imagination within such an economy of space. Every line in this book is a pulsating engine, pulling the reader’s mind further into its own field of imagination, further into the poet’s chalk like mind that bleeds together color, memory and space within the images and music it weaves. She’s alone now, the littlest one, though she doesn’t know it yet. the edge of the edge of the knee. 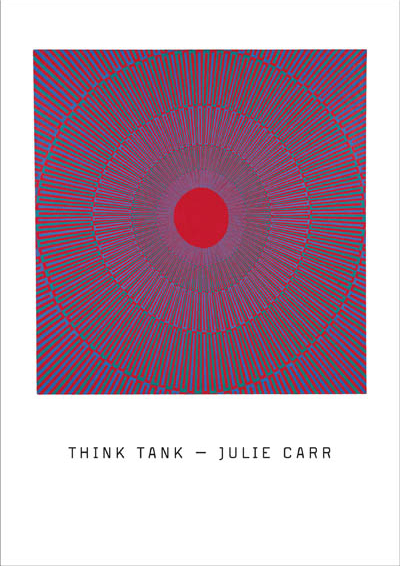 Julie Carr’s, Think Tank, straddles the real and the fantasy, producing a text that disengages from itself before returning once more. The words that move the reader from the multiple minds of the poet are themselves far from arbitrary. This book succeeds in its ability to be ever morphing itself into meanings. Think Tank is available from Solid Objects. Whitney Kerutis is from Arizona. She received a Bachelor’s of Arts in English with a minor in French and Creative Writing from The Unviersity of Arizona and will be attending the MFA program for Creative Writing in the genre of poetry at The University of Colorado Boulder in the Fall 2015.